Posts have been a bit spotty on here recently, which is entirely down to work suddenly rearing its ugly head and leaving me with precious little time to play games, let alone write about them. I shall attempt to rectify the situation this week. STAY TUNED. Rise of Nations is well thought of by those who played it a decade ago, but that’s not a very large number of people – even I missed out on it at the time. While successful it wasn’t a smash hit like Age of Empires, and so there’s a decent argument for resurrecting it in digital format and presenting it to a much larger audience. Rise of Nations has been genuinely unavailable to buy – at least in the UK – for a couple of years now (unless you count the dodgy Ubisoft copies you can find on Amazon that may or may not come with a CD key). This situation has been exacerbated by the legal uncertainties following the implosion of RoN developer Big Huge Games; there’s been an entry for RoN in the Steam database since at least March last year, but (I presume) it’s taken until now for the rights to be sorted out to the point where somebody can actually release it. I really, really liked Megalomania, and aside from the execrable Empire Earth RoN is the only game I can think of that’s really run with the concept of an RTS covering the whole of human history divided into distinct technological epochs. First, the quality of the port. I’m not the best person to judge since I’ve played the non-extended version of RoN for maybe a couple of hours, but it seems pretty damn solid. I haven’t encountered a single bug or crash, and while in-game improvements are limited to support of modern resolutions and Steamworks multiplayer (note that I haven’t tried the latter) I think RoN is a game whose visuals have aged better than most and which really benefits from this HD rerelease. Certainly more care has been taken over making sure buttons and icons scale up correctly than certain other Extended Editions I could mention, and so while it’s nothing particularly flashy this version of Rise of Nations both looks and feels like a modern game. Now, as to the game itself. Since it was conceived and developed at a time when Age of Empires 2 was doing very, very well for itself in the PC gaming charts, it’d be understandable if you mistook it for an AoE knockoff. 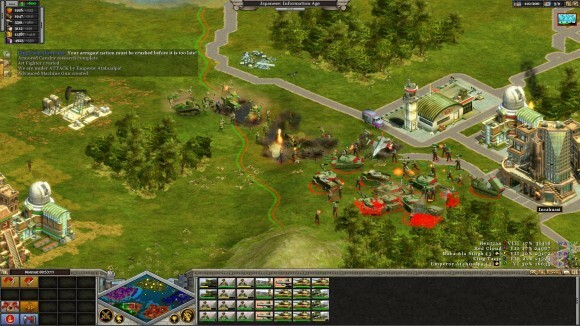 The two games are superficially very similar – start with a town center, send out villagers to gather resources, use resources to research technologies and progress through technological eras/ages, and then use that tech edge to build a huge, technologically advanced army and crush your enemies. I recall the biggest concession Rise of Nations got from the gaming media at the time of release was that it was innovating somewhat by mixing some elements of Civilization into Age of Empire’s basic structure, but that they were otherwise pretty much the same. 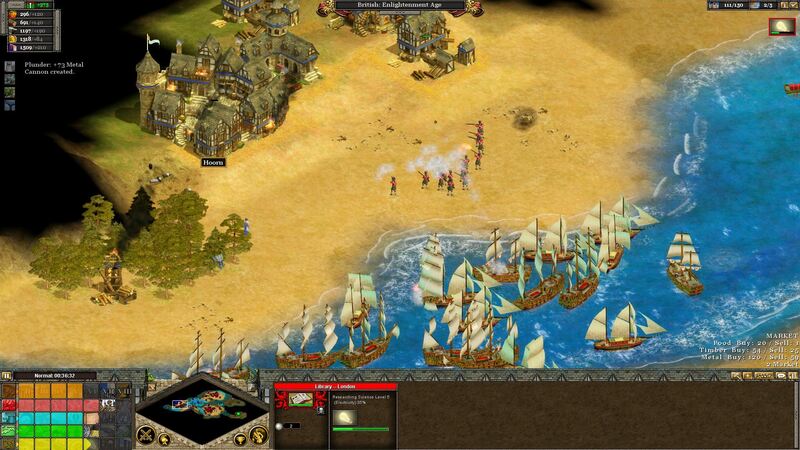 And perhaps they are the same in terms of that basic structure, but as I see it there are two fundamental differences between Age of Empires and Rise of Nations that turn them into very different games. One is the scope – RoN deals with all four thousand years of human civilization inside of an hour where AoE just does one – but the other is the approach each game takes to your economy. 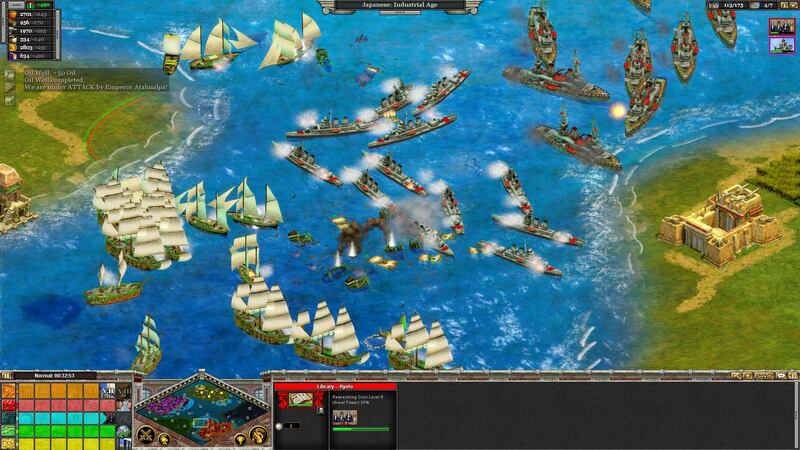 In Age of Empires, your economy exists to support your military. Having a strong economy is important in that it will enable the creation a strong military, but it is the military that wins 90% of games. 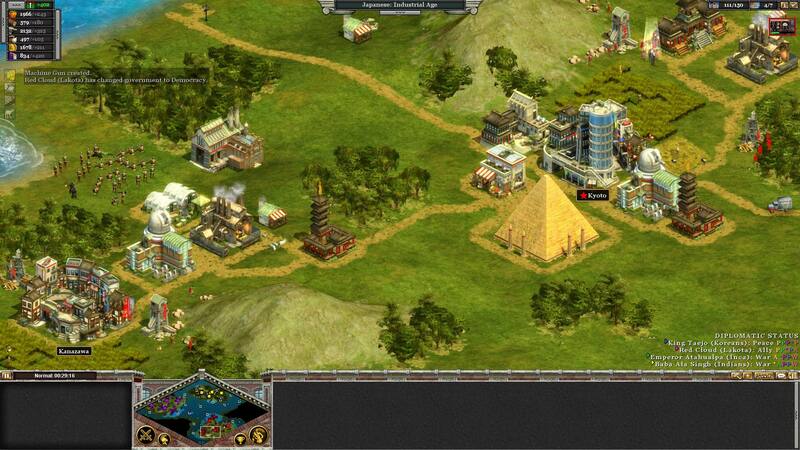 In Rise of Nations, however, your economy exists to support your economy. It’s a recursive relationship that somehow works brilliantly; yes, there are military units in the game and while they’re not absolutely necessary to win you will at least need them if you don’t want to lose, but ultimately your military in RoN is simply a particularly offensive expression of your economy. Building a strong economy is absolutely paramount, then. It’s pretty telling that aside from one direct unit upgrade per era – upgrading a wooden man ‘o war to a steel dreadnought, say – there are no military upgrades in Rise of Nations; no researching better swords or bigger shells for an extra 10% damage output. Instead, the strength of your military is directly related to your economy via the size of your army being limited by your population cap – which can only be increased by researching the Military line of library technologies – and how fast your economy can pump units out. In this Rise of Nations has more in common with Total Annihilation or Supreme Commander than it does Age of Empires, where you’d just set your factories to produce one unit indefinitely and have a steady stream of reinforcements heading to the battlefield just so long as your mass and energy income could pay for it, except the economy in those games was child’s play compared to the economy in Rise of Nations. Resources in Rise of Nations are gathered somewhat differently than in Age of Empires. In Age of Empires, you’d send a villager out to chop some wood, he’d physically bring it back to your lumber mill, and your stock of wood would increase by 10 the moment he deposited it in the store. In Rise of Nations, building a woodcutter’s camp near some trees instead creates a number of woodcutting spaces in the camp (which depends on the size of the forest) that your villagers can then occupy. For each villager assigned to woodcutting, the rate at which you gather wood is increased by 10. In the abstract I suppose it amounts to much the same thing, so it’s a subtle change that nevertheless changes the way you think about the economy: there’s a set of numbers in the top left of the screen that indicate how fast you gather resources, and until you embark on the endgame rampage every single thing you do is geared towards making those numbers go up, which in turn makes your stockpiles go up, which in turn increases the number of techs you can research, which will eventually win you the game. An economy that grows exponentially without any brakes wouldn’t be any fun, though, and there are two speedbumps in Rise of Nations. The first is the number of cities you have. Each city has a given economic radius, and can only gather resources from stuff that falls within that radius. If you need more wood and there’s already a woodcutter’s camp built in your current city, you’re going to have to build a new city next to another source of wood. Each new city you build increases your resource gathering potential depending on what it catches within its economic radius, but the number of cities you can have at once is governed by the Civic tech line, which increases the city limit by 1 per era — so you’re not going to be spreading your economic tendrils over the map until you’ve teched up a few times. The second speedbump is more of a brick wall, however; occasionally you’ll build a new farm or mine or whatever, but instead of those magic numbers at the top left of the screen increasing they’ll stay where they are and start flashing yellow. This means you’ve hit your civilization’s efficiency limit for gathering resources, which represents the maximum rate at which you’re allowed to gather any resource. This starts off fairly low – at 70, which is the equivalent of roughly one and a bit cities’ worth of stuff – and can only be increased by researching down the Commerce tech line, which increases it by around 50 per technology era. Three of the four major tech lines are therefore directly geared towards pushing the limits of your economy outwards. Civic tech increases the number of cities you can have. Commerce tech increases the rate at which you can gather resources from those cities. A lesser consideration is Military tech, which increases your population cap and thus the number of villagers you can have collecting resources at once. The only technology line that doesn’t directly impact your economy are the Science techs – and even those help out by making secondary building-based techs available that increase the rate at which individual cities gather resources (so a Granary starts out by increasing food yield by 20% in a given city, and can then be upgraded to 50% and eventually 100%1). It’s a very single-minded focus that reveals Rise of Nations’ true nature as a game of efficient economic expansion and growth rather than a game of conquest; you spend most of your time lurching between not having enough resources to tech up, overcompensating by building a load of whatever you’re short of and then hitting the efficiency cap. Either extreme indicates wasteful play, and the challenge lies in threading your economic growth between the two states. It’s an interesting challenge, to be sure. I’ve had some great games pitching my economic engine against that of the AI; sometimes I’ve done so well that I’ve managed to rampage across the map fighting three or four AI players at once, and others I’ve had to resort to flinging a dozen ICBMs at the Incans because they outgrew me and were about to win a Wonder victory. It doesn’t come without a cost, however, and that cost is that the combat in RoN is somewhat atrophied. This was unavoidable; with so much focus given to the economy the military side of things was always going to suffer, and while it’s certainly not terrible it’s also very, very abstract. The problem is that with the limited number of military upgrades on offer there’s very little you can do to give yourself an edge in a fight aside from building more units than the other guy. You can upgrade each unit type to a more advanced unit type once per era, but these upgrades don’t really have the impact you’d expect from replacing wooden sailing ships with steel battleships; you’ll be slightly better off but it’ll still come down to numbers and how quickly you can replace your losses compared to your opponent. This is why I say that combat in RoN is almost purely a matter of one economy versus another: if you can build more units you’ll win, and that’s a function of your economy. Quickly going over some other aspects of the game before I wrap things up: there’s a pleasing number of civilizations on offer, and while they don’t play massively differently they do each have strengths geared towards a particular strategy. RoN also does something I really like to see in strategy games: it has two or three different models for each unit and building appropriate to the culture of the civilization that build it – so the US main battle tank unit is recognisably an Abrams, while the Russian/Chinese version is a T-80. The “Quick” single game mode has a lot of different options that have kept me satisfied through a dozen hour-long games; there’s also the Risk-like Conquer The World mode but I absolutely hated this since it didn’t give you anywhere near enough to do on the empire map and removed most of the economic tinkering from the RTS segment, replacing it with a combat system that, devoid of its economic context, was downright depressing to have to deal with. That being said I do think I’m coming to the end of my time with it now; the game doesn’t have the inherent replayability of a Civilization or the coherent campaign of an Age of Empires, which I think does limit its lifespan somewhat. Still, this Extended Edition of Rise of Nations has been a very respectable effort that I think has justified its asking price – not necessarily through any improvements the EE makes to RoN itself, but simply because the core gameplay has aged very, very well and the visuals have responded nicely to the various touch-ups present in this version of the game. While £12 is towards the upper bounds of what I’d be willing to pay for a rerelease of a ten year old game it is at least somewhat more reasonable than the eyebrow-raising £15 that was being asked for Age of Empires 2 HD, or the frankly ridiculous £23 price tag on the recent Age of Mythology Extended Edition. If you’ve played Rise of Nations before then this version isn’t exactly going to rock your world, but it is much more pleasant to deal with than the original2 and I’d recommend it on the basis of that alone. And if you haven’t and you’re interested, well, I think this is the version to get. Pending evaluation of the multiplayer, this is an Extended Edition done right. - The port vastly improves graphics. Screens don’t show much as the difference mostly comes with animation. Original RoN (and spiritual successor Rise of Legends) had strange animation frame cap: even when the game itself has 60 fps, units move with something like 10 fps and don’t care about your GeForce GTX. It’s fixed now and with AA the game looks very nice: 2D static buildings combined with 3D models are the way to go. - I see you’ve only tried Conquer the World campaign. It’s rather simplistic, I agree, but check out other campaigns. You have Alexander the Great (rather straightforward Age of Empires-style campaign with focus on single scenarios, but with some alternative paths like possibility of crushing Rome for some reason); New World (you can play as several native, metropolian and colonial forces. Natives are weaker and have no horses or guns); Napoleon (diplomacy, historical scenarios, alternative paths) and a little gem of Cold War (many additional diplomatic, economic and espionage complications). I’m hoping the game will be popular enough for developers to bring new campaigns. - I’ve played a single multiplayer duel game and it worked ok. The problem is with filthy humans – they all try to create 8 players Big Huge maps and it seems that the game doesn’t work well with big multiplayer battles. Anyway, if you need sane multiplayer opponent, you know who to ask. Yeah, I’d recommend giving the Cold War campaign a go, it’s flawed, but an interesting variant on the theme. Hmm, my usual assumption with strategy games is that any scenario is simply a more limited version of whatever the “full” version of the game is, but that may not be true in this case. Okay, I’ll give it a try later on. Alexei: interesting point on the visuals. I knew they’d done a little more than just increase the resolution, but from what you say the game’s good looks aren’t just down to graphics that have aged well. Regardless, it’s an excellent HD update worthy of the term. The scenario bolts onto the tribute system various triggers, like Finland leaving if you don’t invest enough in it, or buying nukes. There are also events like North Korea offering to become a client state if you play the USSR, or interventions in Vietnam, etc. The missions are also mostly tailor-made with maps of the regions, although they’re often not *that* satisfying and you still have the odd thing of levelling up in the library during an invasion of Brazil. You also have the option of spending 20 tribute a turn on a custom-made espionage mission, which gives you various perks or causes a region to turn to your side. It is a cut-down version of the full game, but there are a lot of new features added. I think it was originally part of the add-on pack for the game, hence the extra attention paid to it. The combat becomes more interesting if you can master things like spies, commandos, and generals (which I’ve admittedly always been bad about). 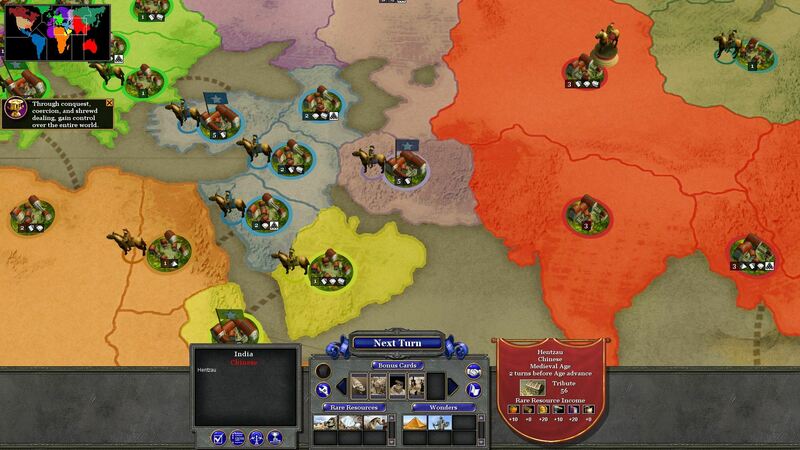 There are also stances and formations that can make a difference, particularly for the Americans, whose powerful unique units can automatically entrench if not in combat or set to passive mode. 1) Territory control is very important, and the game uses attrition to drive this home. Units in enemy territory without a supply wagon nearby take constant damage; this damage can be increased via upgrades, and the Russians inflict 200% attrition, so battles can be won or lost through supply cart management. 2) Mixed army compositions are crucial. Siege weapons are best for taking cities–which are the heart of the gameplay, as you mentioned–but only infantry can actually take cities. However, there’s a rock-paper-scissors element to all units and aircraft tend to dominate the late game, so defenses have to be covered; unit spam isn’t the answer. 3) All units and buildings increase in cost with number. Your second swordsman is more expensive than your first, as is your second barracks, your second farm, etc. This further incentivizes a strong economy and capturing enemy cities and places more restrictions on rushing and unit spam. 4) The soundtrack is really good and makes excellent use of a central theme. 5) The interface allows you to conduct your main research and resource management without having to open another window. It’s very elegant. Yeah, stuff like pressing “L” to see the library is important, since there’s so much to click on. One of my (personal) criticisms is that there’s too much stuff to click, which gets in the way of whatever the core game is trying to be, but maybe that’s because I’m reaching 30 and don’t have the reaction times of a Korean 16-year-old on amphetamines. It’s definitely not terrible and has some thought put into it, but the army composition seemed to be just a matter of making sure you had a mix of everything — so one barracks building light infantry, another building heavy infantry, another building machine guns etc etc. I must admit I never tried to use spies/commandos, though, since their abilities seemed like they’d be too micro-y in a game that was all about the macro. The exponentional growth is a good — if gamey — way to prioritise efficiency over simply building more cities. Once I’d figured out what was going on and started maximising the potential of my current cities over building new ones the time it took me to reach the Information Age was cut by around 25%. So about the game itself. As you’ve noted it’s very much economic strategy and a strategy in an olden kind of way – tactics do not matter as much, instead your concern is economy, development, trade, borders, supply, population exploitation. So it’s really close to Civilization. It’s the only RTS where you feel like you govern state, not an army with barracks. That’s why the battles themselves aren’t very tactical: you win by strategic decision of composing a specific army, developing specific troops, choosing the right place for engagement, supply etc. That’s why generals and spies feel strange in this game but perhaps it’s a nod to those who want micro-control their troops. So as a strategy it beats all those boring tactical microcontrol RTSes which, in my opinion, lived on exploitation and crippled interface – I may have some beautiful plan in Starcraft but most often it looks like you don’t have much choice in choosing where to expand and only decide with what and when to attack – and even if the plan is brilliant, microcontrol is the king. Rise of Nations feels like everything you do is important, not just the war itself. Because of all this I feel Rise of Nations is the only RTS truly appealing to me and could be the saviour of repetitive and stagnant genre which is almost dead by now. Actually, there’s a little button at the very top middle of the screen that will let you access the Library at all times. Very handy. Er, this was supposed to be a reply to Gap Gen. I prefer a “build everything” approach over something like Starcraft, where you are essentially doomed if you don’t have a precise army composition tailored for the very specific circumstances you find yourself in. I’ve never been good with spies and commandos, either, but the AI knows how to make use of them, and they are extremely effective. And yes, 2-3 efficient cities is really all you need. I’m glad you pointed out the animations. I always wondered why the units looked kind of janky, especially in Rise of Legends. I actually wouldn’t mind seeing a Rise of Legends re-release, as it’s got some neat ideas as well and some genuinely cool unit designs. > Posts have been a bit spotty on here recently, which is entirely down to work suddenly rearing its ugly head and leaving me with precious little time to play games, let alone write about them. I shall attempt to rectify the situation this week. STAY TUNED. You’re going to quit your job?